Double Xmas Competition - Exchange Trading, Sports Tips And Crypto. We have a dualTripple bonanza here at Juicestorm for the Xmas holiday. And not two but three prizes are up for grabs! Its the same as our last competition, all you have to do is add a comment for you chance to win, please read the full post as you have an opportunity for up to three entries per person and you are allowed to enter for all three prizes. Adam Todd from Racing Traders has kindly given us 2 prizes. 1st prize — 3 months unlimited access to the Ladder Interface (worth £50). 2nd prize — 2000 minutes of access of the ladder interface (worth £20). BetBotPro is a brand new Automated Betfair API Software which will supercharge your betting activities even while you’re away at work or simply want to spend time with your family. You can bet on UK/US/AUS/RSA Horse Racing & UK/AUS Greyhound racing, what ever takes your fancy. You can select the 1st, 2nd, 3rd or 4th favourites, an individual/multiple horse or greyhound to win or lose in that race. If you use a tipster service simply select their selections provided and go off and do what you want for the day. 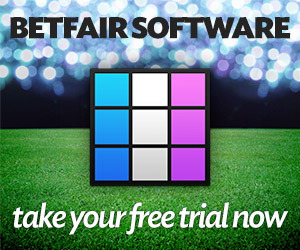 This software takes the hassle out of betting. You simply need to spend a few minutes everyday to select your selections and BetBotPRO will do the rest. BetTrader was designed and developed by one of Betfair’s most successful traders, who turned £200 into £100,000. BetTrader is widely recognised as one of Betfair’s most intuitive and most popular trading applications. And IMO it has the clearest price action charting available anywhere which makes it a pleasure to work with and will help you to trade a profit on most races. It really can give you an edge. BetTrader’s free Grid Interface displays live updating Betfair markets, has a high speed bet submission process requiring no mouse movement, and is completely free to use for as long as you want. BetTrader’s popular Ladder Interface has an intuitive vertical price display and an even faster one click bet submission process for the most demanding and price sensitive Betfair user. You may enter for all three prizes and you can have up to three entries to each draw. Firstly you will need to download a trial of either BetBotPro or Racing Traders (or Both). Both require you to have an account with Betfair. Click here for the betfair website. Add comment to this post saying which one you would want to win (you can enter both). 1: The email address you use when commenting must be the same as that used to download the trial for verification. And you must be willing to submit your Betfair user name if you win. (Your email and/or Betfair user name will never be published). 2: One comment per person, this enters you for all three prizes. 3: Tell us in the same comment if you are a subscriber to the Juicestorm newsletter, you will get an extra entry (same email required). 4: Post a comment to this competition from your blog/website (and let us know in the same comment) for a third entry. 5: Current Bet Trader users and BetbotPro trial user can still enter. The Draw will take place on January 7th at 1pm Live on our Radio show, we will use a random number generator for the draw. One entry per user Duplicate/Double/ Same IP entries will be void. Please only enter for the software you will actually make use of. No cash alternatives. Adam Todd & Mark Baker reserve the right to withdraw the prizes if they start getting spammed with duplicate trial downloads. If you have any questions use our contact page and get in touch. Can you get better than Oddsmatcher? There are 143 Guests online and 86 Members Logged In currently reading JuiceStorm.com. Welcome everyone. Join TradeChat for a chance EVERY month to win a year's subscription to TradeSelect - worth £600!